Cost : $480 per head for members and guests. 10% discount for Fine Wine Club members. Wines : There will be four gorgeous French - one Champagne and three Bordeaux red with good scores and reviews. Bordeaux. : 2009 Chateau Pellebouc, Bordeaux Superior. A special feature of this event will be the rare opportunity to hear the introduction of the wines by Mr. Laurent Bonnet, a Bordeaux Negociante and CEO of LD Vins, which will supply three wines for the dinner. The event is once again wholly sponsored by Alsco Enterprises Ltd and co-organised by the Fine Wine Club. As usual you will also enjoy a sumptuous banquet of excellent Cantonese food prepared by our famed chef ! There will also be available for purchase the tasted wines at good discounts. Please sign up early ! The Fine Wine Club would also like to announce a coming subscription for a super-value RP 92 Spanish wine at only $168 a bottle ! So please renew your membership now or join as new members for only $200 per year. Watch out for details next week. 1. Please complete the form in below with payment and email to Ms. Natalie Wong at natalie.wong@hkuaa.hk ON or BEFORE 13th March, 2017. If you enroll together with your friend(s), please copy the form twice and complete it for your friend(s) as well. 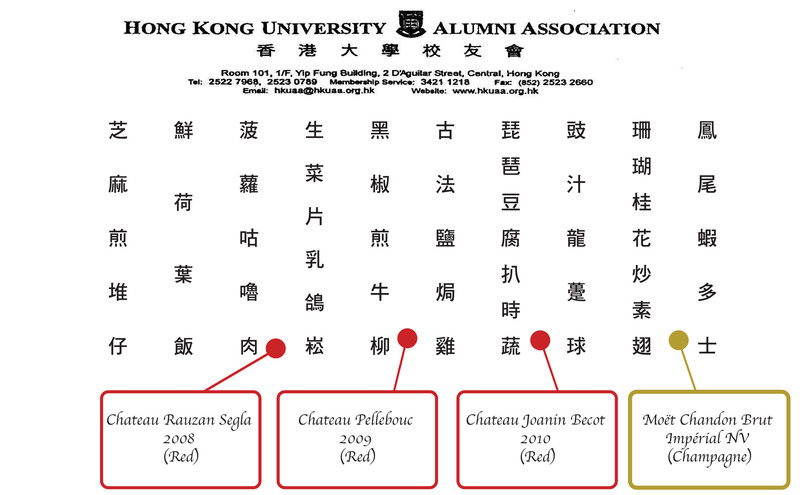 Please send the cheque to Room 101, 1/F, Yip Fung Building, 2 D’Aguilar Street, Central, Hong Kong.